We've been receiving a fair amount of book-filled boxes from Scholastic Books lately. Some of them come as surprises and others are ones that I was invited to review. I noted here a few weeks ago that I hadn't been reviewing much in the way of children's books recently and that's a reflection of the amount of time I've spent reading picture books with my kids. Now that the oldest child is eight, I find myself focusing more on chapter books and less on picture books. As my youngest is two though, I really need to make sure I'm still dabbling in picture books! I've been slacking! The kids are enjoying this refocused attention on shorter (and illustrated) stories and I will strive to keep it up. 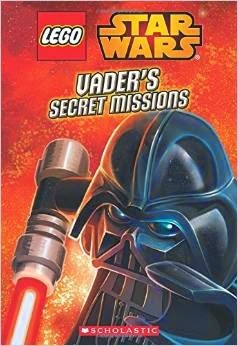 This book is about Darth Vadar's missions and what happened before the original six movies. Before the six movies they were all good guys. Then some Jedi wanted more and more power and they turned against the other Jedi and were called "The Fallen Jedi." Right before the six movies there was a very long and bad battle and the fallen Jedi went to a new planet which had people called The Sith. The Sith who were very good at handling the force. The Fallen Jedi took control of the planet. The strongest Fallen Jedi became the first Dark Lord of the Sith. Q1: Did you like this book? Yes. Q2: Why did you like it? I mostly liked the stories. Q3: This is a LEGO Star Wars book, correct? Yes. Q4: Were any of the illustrations scary or disturbing to you? No. Q5: Was the book tense or scary at any point? Not really, no. Q6: Is there anything that you would want me or other parents to know about this book? It is not scary. There are no bad parts. Q7: How old would you say a kid should be before they read it? It isn't scary but it's kind of confusing in parts. Probably ages 7 or 8. In our case, I think this book hit the mark. It was a fast read for my Bookworm but a curiously fun one and that was the point. 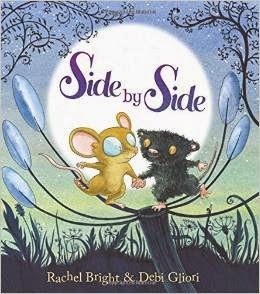 Next up, we received Side By Side , by Rachel bright and Debi Gliori. some spiky, some furry, some short, and some tall. One such creature is a tiny, itty bitty little mouse who has a hard time keeping up with all of her older brothers and sisters. All she wants is a friend to share life with. Someone who will walk with her side-by-side. As you might imagine she eventually discovers such a friend who has been hiding about (on each page spread) all the while. This is a sweet story about loneliness and the satisfaction of finding a friend. I thought it was delightful. 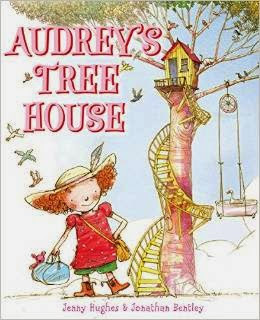 Another title which captured imaginations in our house was Audrey's Tree House , by Jenny Hughes and Jonathan Bentley. Audrey considers herself a big girl and tells her dad that she's just too big to share a house with him anymore. She suggests he'll need to build her another place to live and he appears in every way to be agreeable. He builds her quite the drool-over-this-treehouse with windy stairs, a lovely comfortable bed and all of the amenities one could imagine needing in such a fine treetop home. She loves the house and all but she wonders aloud what will happen to her if it gets to cold or too rainy. Her dad assures her that there is a nice, warm home where she will always be welcome and, in the end, she decides that maybe she's not too big for home after all. Now, this is a cute story and it made me to want a tree house like Aubrey's. The pictures really get the imagination in gear. It's cute, it's imaginative, and it's fun. But I can't honestly tell you that I'm going to hang on to the book. It was fun reading once (maybe twice) but I didn't feel wholly attached to it. The concept of the book is great but (in my opinion) Audrey was a little demanding of her father. By taking a look at the tree house I can only imagine her in my mind's eye as something of a spoiled brat. I don't author Jenny Hughes necessarily meant to portray her that way, but that's how she reads off to me. Perhaps my opinions is harsh but it is my opinion and so this book won't be living with us in our home. I still want a treehouse like Audrey's though because it's super cool. 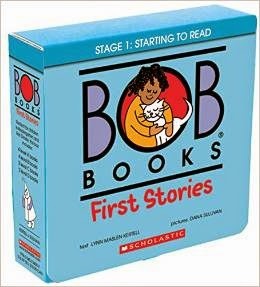 Bookworm3, my four-year-old girl was SO excited to see Bob Books: First Stories in one of our Scholastic boxes. Why? Because her brothers read Bob Books and she. has. been. waiting. to start for herself. "Sam and Mat. Mat ran. Can Sam?" They are quite perfect for her at the present moment. She loves them; we love them. She can read! We all rejoice! Hoorah! "Mat is glad the sun is up. Sam is glad to see the sun." It is very true though that the more you read, the easier it becomes and she is just loving these books. Anything which sparks a desire to read and builds one's pride in this accomplishment is good by me. If you are looking for a set of beginning books with simple sentences for your youngster, check out this new series of Bob Books. With that, we'll bring this post to a close. Many thanks to Scholastic Books for sending the above titles my direction in order to facilitate the above reviews. I received no further compensation for this post and all opinions are decidedly my own. I cannot believe she is reading. That...wow! WOW! The Bob books bring back fond memories of my siblings learning to read. Teach Your Child to Read in 100 Easy Lessons is recommended by many adoptive parents as well. Interesting! I'll have to get my hands on a copy. I am DYING to know what Cin-Ru's English level is but there's really no way for me to find out at this point. We're lucky if we hear single words from her on our Skype calls (or anything at all, the way the last two calls have gone! ).